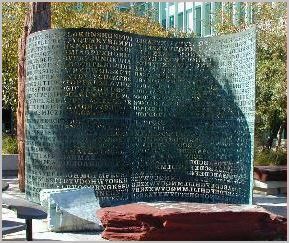 A book I read November 26, 2009 mentioned the Kryptos sculpture which after many years remains unsolved. This puzzle caught my interest and I set about that evening to look it over for clues. After seeing the letter code, my attention soon shifted to the shape and patterns of the sculpture itself, the code layout and key printout. My way of show and tell as to what I did is through a series of images mainly. Using grid paper and 26 x 26 columns for the letters of the alphabet, I wrote this part of the key on it. 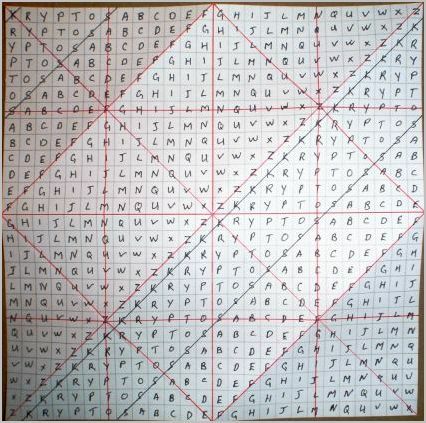 Then I outlined with black lines the Kryptos words and added red folding lines. 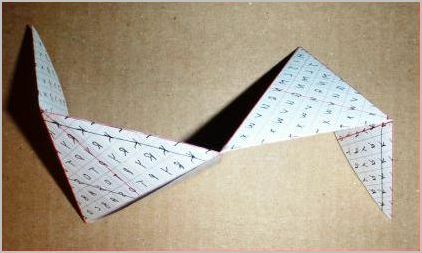 When rotating the ends of the paper model together so they meet as opposites it forms the tetrahedron shape. Perhaps the missing triangle represents the whirlpool hole located next to the sculpture, and maybe James Sanborn had in mind life and renewal when he created this sculpture. I base that conclusion on the materials he chose to incorporate, and that originally, he intended to have a living tree where now the whirlpool is. 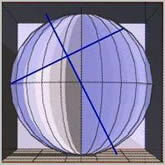 Furthermore, the placement of the rocks on angles is another deliberate clue. 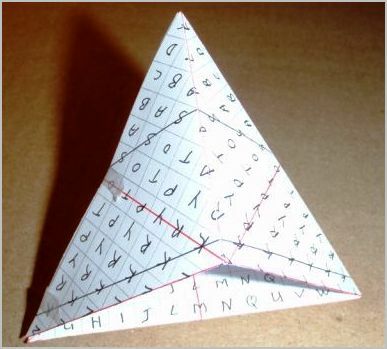 When folding the paper, the letters X and W overlap K and R, and when doing them all, A becomes L, B- J, C- I, etc. 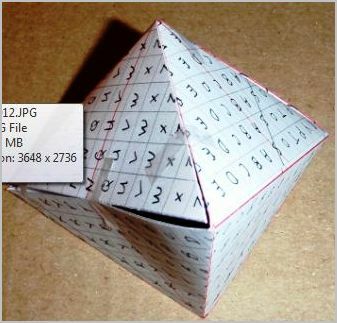 Therefore, it creates a second level of letters, but I am not familiar with encryption. The left top code panel has 436 characters total, consisting of 433 letters and 3 question marks. 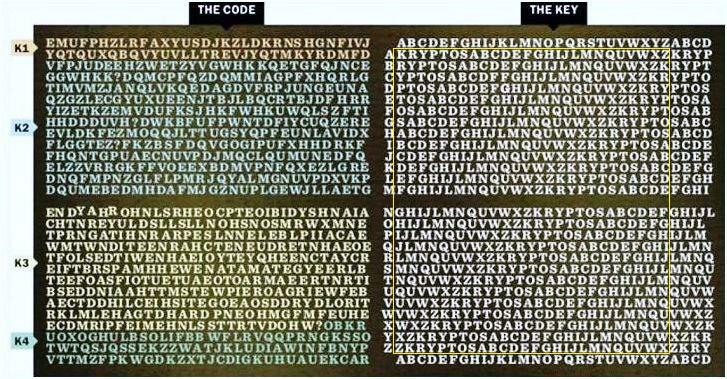 The bottom code panel has 434 characters consisting of 433 letters and 1 question mark. The key panels have 433 and 434 each. This may indicate a link to speed of light. Einstein's famous E=mc2 equation of energy and matter, where E= energy, m= matter, and where c2= the universal constant speed of light, or 186624 miles per second, or 4322. 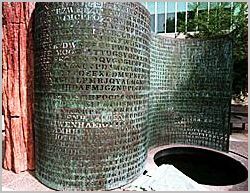 When the Kryptos location coordinates 38°57' 6.5" N and 77°08' 44" W are added and subtracted from each other, they become: 38°11' 37.5" N and 116°05' 50.5" W. Those coordinates are located in Nye County, Nevada. The Nevada Nuclear test site and the proposed Yucca Mountain Nuclear waste repository are located there. Nuclear reactor fuel and other radioactive waste would be, or is placed, in a deep geological repository i.e. "Vault". Clues in J Sanborn's decrypted messages talk about "invisible", "underground", "buried" and "Langley". Could this be the Nasa 'Langley' Research Centre where they do research on Nuclear Physics for space missions? 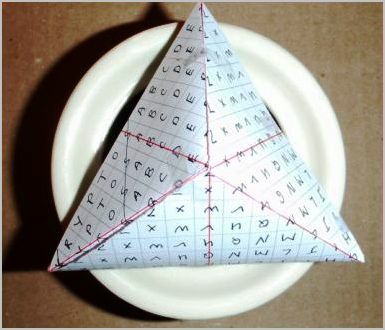 Perhaps those coordinates to that location in Nye County are part of this puzzle. Lastly, an interesting pattern are the 9 spaces separating N and Y as well as Y and E.